Introducing the first of a new concept of Battle Packs. Complimenting our ever popular Army Packs, the Battle Packs are designed to fit specific battles with figures handpicked to represent as authentically as possible the individual actions and encounters within the battle. 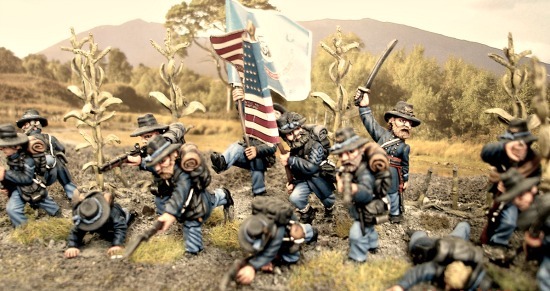 The American Civil War was renowned for many famous battles and heroic actions on both sides and with our range of figures it is possible to re-create many of these. Known as the single bloodiest day in American History, the battle of Antietam marked the culmination of Gen. Robert E Lee's first invasion of the North, crossing the Potomac river in early September 1862.During September 15-16th both armies gathered on opposite sides of Antietam creek. Fighting began on a foggy dawn on the 17th and continued relentlessly all day with both sides suffering heavy losses. At sundown both Confederate and the Union armies of Gen.George McClellan still held their ground despite casualties of over 22,000 men. With our 2 Antietam armies you can fight the actions of Miller's Cornfield, Hagerstown turnpike, Burnside's bridge and the "Bloody Lane". Battle Packs can be added onto with our 24 man Unit Packs. Our Battleflag standards DIX/ACW05- Hoods Texas Brigade and DIX/ACW06 - "Bloody Lane" are recommended for use with ACW/BP2 - Lee's Army.